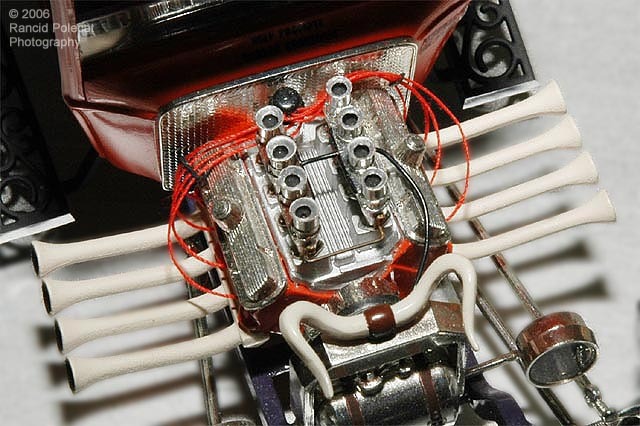 Long before comapanies like Detail Master started offering us rubber-coated small-diameter spark plug wires for our model engines, sewing thread was the order of the day. Here Norman used red sewing thread that had been smoothed by coating it with bee's wax for his plug wires. Those nifty wire seperators were made by hand. The were no photoetched parts suppliers in those days to make detailling model cars easy. Norman had to drill each line of holes a straight as he could in a thin sheet of plastic, then hand file the seperator to shape.